Google introduced two new features in Google+, one is Embed your posts and another is Author Attribution for Wordpress users. Now the site owners and bloggers can embed your Google+ posts or any public posts to anywhere on the web. 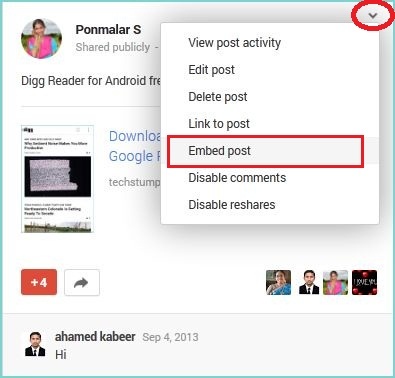 So you can expand your audience across the web easily with embedding your Google+ shares on your blog. Google+ posts can be embedded as a primary source or highlight your point of view in your articles. This feature allows you to embed Google+ posts including links, images and videos with follow button, +1 button and comments. Embedded posts can be seen by anyone there is no need of Google account. How to add your Google+ posts to your Blog? • You will get an iframe window that contains code to embed the posts. • Copy the code and paste to your blog / site. Note: Users can embed all type of public posts except the posts from within a community, restricted posts to a Google Apps domain, private posts, Events and Google+ Hangouts on Air posts.